I know the vegetarians out there are like, “enough already with chicken,” but I want to talk about this affordable, pre-cooked option that many rely on to make their weeks easy (and it is healthier than most fast food). I have written about Costco rotisserie chicken – which has to be one of the best deals on the planet as well as slow cooker whole chicken for an easy whole chicken option. How much sodium is added to the chicken? How long is it on the “Hot Table”? Is this chicken antibiotic free? There is no nutrition facts label on prepared foods in supermarkets but that is going to change in December 2015. The hot table is important because the FDA requires that retailers should hold cooked poultry to a safe minimum internal temperature of 165°F or higher as measured with a food thermometer. That is HOT! I am concerned with the taste and texture of the chicken when it sits at this temperature. Finally, I like to buy the best chicken that I can afford. That isn’t always an organic chicken but I am for antibiotic free birds. The Stop & Shop Chicken cost $5.99. For the flavored chicken – it was 490 mg of sodium for four ounces (20% of your daily value) – yikes! The chicken I bought was actually burnt. Obviously, it had spent too long on the hot table. When I reviewed the ingredients – sucralose was one of them. Why would you put artificial sweetener on a chicken? The real shocker was when the employee told me that a homeless person kept trying to store her winter gloves in the hot table to get dry. Oh man. Then I went to Whole Foods because I wanted to know if their chicken was any better. It is an expensive option but I am willing to pay the price for a better chicken. The Whole Foods regular (not organic) chicken was $9.99 but you could get 2 for $15. They had no nutrition facts for me to see. They did have a chicken that was not touched by anything (no flavors or brine) and they were sold out of them at 11 AM. They told me that they would hold one for me if I called. The chicken is on the hot table for FOUR hours. Chicken is antibiotic free and all sorts of other good stuff, though they couldn’t tell me the name of the farm. They said, “local sources”. Neither store could tell me the temperature of the hot table or had a thermometer monitoring it. I think that is important given the food safety issues of a lower temperature. Ask the deli when the chicken was placed out. Do not buy chicken that has dried out and burned from too long on the table. Duh. Buy the ones without the rubs or flavors to keep the sodium and weird ingredients in check. If you have a Whole Foods near by – 2 cooked chickens for $15 isn’t a bad price. Do you buy rotisserie chicken? What do you look for? I'm scared of rotisserie chickens. I need to know what's in my food. Instead I roast a chicken a couple times a month and then slice the breast meat for sandwiches and package the rest for the freezer t be used in recipes. That also gives me the bones that I collect in the freezer for making stock. 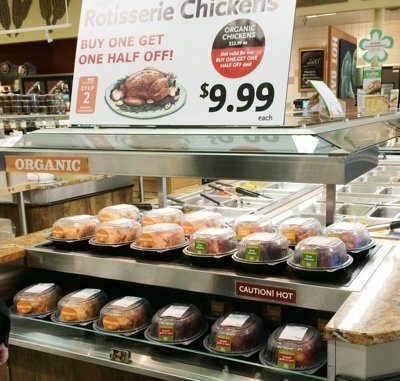 I used to buy rotisserie chicken occasionally but a) once a friend and her young children got food poisoning from one and that turned me off, and b) I am super disturbed by the fact that it is sitting in the hot table for HOURS in PLASTIC! Even if this is a food-grade plastic, that can't be good for us. My hubby always reminds me that I'm not a chemist, but I still feel that eating chicken (and feeding it to my kids) that has been heating in a plastic container makes me feel squeamish. Believe it or not I avoid buying rotisserie chicken because I do not add salt to my food (you know there is "hidden" salt in practically everything we eat...you already know that)...and the second the chicken hits my mouth I know that it is "Sodium City"
On the rare occasion that I DO buy it. I remove the skin, I eat the white meat (and maybe the wings) and give my husband the dark meat. Also, Kroger has one of the healthiest versions I have found (not their usual rotisserie chicken, but the one branded "Simple Truth")...it is in the deli section and isn't always right next to their normal rotisserie chicken. The Simple Truth chicken tastes as if it has less sodium than any other that I have tasted. I also try and get them RIGHT when they were put out .....or, I get them when they have been moved to the "cool" (as in temperature, they don't walk around in sun glasses lol) area. If you have a Kroger, check out this one and see what you think. Costco makes a huge (of course, everything at Costco is bigger) pretty good, deli roasted chicken. I have also noticed that they don't seem to put many out at a time (could be wrong about that) but they sell FAST! I would be very interested in knowing more about their chickens but as with many things at Costco it's difficult to find any info about their products. I've actually had to email them for nutritional info on some of their store made products - guess I'll do the same for their deli chicken. I choose it only occasionally because it seems too good to be true (salty in my opinion)...but a better choice than going to a restaurant or fast food place for chicken dinner in my opinion. 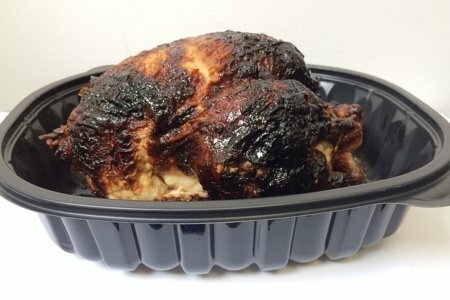 Anyone have any information on Costco rotisserie chickens, which everyone I know says are the best? Thanks for this review, Lisa. I'd really like to have more info on the source of Stop & Shop's rotis chickens which I rarely buy. It's really just grocery store fast-food and probably is not a high standard product. Does Whole Foods sell an organic one? Snack Girl: What year was it that the FDA started requiring that the calories and ingredients be listed on labels? I remember when it was first being considered: people were hysterical over the 'government interference'. It was going to 'destroy the earth as we knew it'. It would be interesting to read those predictions by the food ingredient naysayers. I do remember that it was a BATTLE. Reading the labels is second nature to most of us now. I totally changed my grocery shopping habits once I discovered the fat, sugar and salt content my purchases. The food corporations used the cheapest, and frequently the least healthy, ingredients possible. When people (who could now read the ingredients) stopped buying their products, the food processors were forced to make changes. Accountability is the answer: without the FDA stepping in, grocers would never willingly list the ingredients, calorie counts, or amount of time the deli food has been sitting around. I can't wait for that requirement to go into effect. I always felt that rotisserie chickens were too good to be true: we will soon discover that they probably are. The moist chicken is probably injected with fat, and those hot 'browned' chickens have probably been in those plastic package for several hours. I work with clients all over the country (in person, and by Skype, email and phone) regarding weight issues. Lesson one: read labels and be aware before that first bite. I buy the chickens once or twice a month just for a quick meal. I've bought from Giant, Food Lion, Weis and Walmart (no Whole Foods or Stop & Shop in my area). The time the chicken "expires" is always written on the bag/container. Like others I remove the skin. Here is my choice. Every few weeks or so, my husband is going to go to the store and pick up a rotisserie chicken which we will eat half of one night (he likes the dark meat and I like the white) with veggies and a salad or rice, then he is going to take the other half for the next night and make a really good chicken salad that is pretty healthy. This is a big change for the man who used to pick up fried chicken every other week or so with coleslaw and super wonderful but fat-filled biscuits. I make a great roasted chicken on my own but this is one of those things that I am not going to pick at if he is going to pick up not fried chicken. Yes, I would rather have a fresh roasted chicken but sometimes you take the lesser of two evils. I'm happy that more information is going to be available on what is in them and maybe that will change my choices over time. For now, it isn't fried and I'm not cooking it. By the way, thanks for your great blog! I have your cookbook and have been working my way through the recipes. Good stuff! I would also like to know the information on the Costco chickens. It is our "fast food" option when I have had an afternoon/ evening of driving kids around and no time to make dinner. Wegmans sells organic rotisserie chickens (for almost 3x the cost of their non-organic), but our Wegmans parking lot configuration is something I don't want to fight in the evening. We call these "cheater chickens" and they are our go to quick meal when we are short on time. We are fortunate that our local grocery store does not brine them and keeps them HOT in the cooker. I have tried these chickens from both Walmart and Redners. Walmart chickens have a strange underlying taste which I don't like. Redners chickens taste great and are usually perfectly cooked. I spoke to the Deli Manager (who is a neighbor) and she told me they don't put anything on them, but she didn't know if anything was added prior to the chickens arriving at their store. Thanks for this article because I definitely am going to check out the labels. My local supermarket time stamps when the chicken was placed in the hot table. Also on the label is that the outside has been seasoned, which I pull off all the skin and toss it anyway. I realize they are probably higher in sodium, but for a quick meal a couple times a month, I'm ok with it. BJ's also sells rotisserie chicken and I guess I'm lucky as I seem to arrive (after work, usually on a Thursday) when the "cook" is removing the roasted chickens and bagging them. They use a "bag" as well as the typical two part "clamshell". BJ's also sells an organic chicken for a dollar or so more. The 'regular' chicken is Purdue and the organic is Harvestland. BTW, I have started making a new, pre-seasoned & prepped Purdue chicken from BJ's - - it's 9.99 for an 8 lb. oven stuffer w/o the included "parts" like the liver and neck. It IS delicious but not a quick dinner on a weeknight. I have been know to purchase two RC's take them home and strip them down for making enchiladas. The meat is super moist and you can really pick off every delectable morsel. What about the obvious charred carcinogens all over it? I usually buy them at A&P and agree they are very salty. I bought one once at Walmart and it was raw in the very middle, so no more chicken from Walmart. I will only buy the Kirkland Signature rotisserie chickens. Otherwise, I'll roast my own bird. The birds "fly" off the warming tables, with folks (myself included) often waiting for them to come off the spits, fresh and hot. Without having the label in front of me, I'm certain that there is plenty to be cautious about (you can try this link: http://www.fatsecret.com/calories-nutrition/costco/rotisserie-chicken). Fat and salt are relatively high, but no higher than grocery store birds. For $4.99, I can get a 3-lb bird, cooked to perfect doneness and ready to eat - perfect after battling the crowd at Costco after work (I never go on the weekends). I eat the bird fresh, and will use the leftovers in a variety of ways, including boiling the dregs (including bones, gristle, skin, etc.) down to a lovely seasoned stock. Chill enough to trim the fat off, and freeze for soup base. Sure, I can make my own. And I do, when time allows. It's better than any store-bought bird, Costco included. But, for the price and convenience, there's not a lot that can beat it. I am a big fan of the ones at Sam's Club, which are the same as Costco's, from what I am reading. I haven't been to a Costco to try theirs - none closeby for me. The ones at Sam's club sell fast, taste fantastic, and are a great price, and nice a big, and juicy. I buy 2 at a time and freeze one so I can have a backup when we're in the mood. I go there about once every 6 weeks. I keep the skin eating to a minimum and we eat it for a meal one night for the family, then the small amount of leftovers are finished off by me for lunch one day. Ours never lasts for longer than that with a family of 2 adults and 2 young boys. All of them are way too salty. Because I watch my sodium, I grab a whole chicken that has not been injected with any enhancers from Sprouts, season it and cook it. I usually do this on a Sunday and I can eat it during the week. This was interesting. I was curious about the rotisserie chicken. How is it made? How is there so much more fat than regular chicken? I've made rotisserie chicken before and I only used spices. Are places adding oil too? Costco does have amazing chicken and most of their deli items have nutrition information in My Fitness Pal already. I use to eat in a café that had the best chicken salad. I asked the owner once what her secret was. She said Costco chickens. Jeanne, I too think that BJ's has delicious moist rotisserie chickens; however, I do not buy them anymore because I was told that the reason they are so moist is because they are injected with fat to keep them moist. I do not like eating anything that does not have a label with ingredients. I like to be an informed consumer. If I am going to consume something unhealthy or fattening, I want it to be my choice. Yes, guilty .. esp if I'm in a bind and need dinner - now! I try to buy a cooked chicken from Whole Foods, but it's not always possible. So a regular grocery store chicken will end up on the dinner table. Great information! It's really easy to make one yourself and healthier! How about a recipe for this on an upcoming post? I work at a Walmart and we offer plain rotisserie chicken. We time stamp them when they go in the oven when they come out and then they are pulled after one hour and follow a strict chilling process. We sell almost 100 a week day and over 200 in the weekends. Even if you buy the "flavored" ones if you remove the skin that is where most of the seasoning and sodium are. Not something I would buy everyday but in my mind better than deep fried or fast food. You are so intriguing Snack Girl, I have read this entire post despite being staunch veggie of 20 years! Market Basket charges $3.69. At that price they could inject toxic waste into it and I'd probably still buy it. I was talking about the restaurant chain, BOSTON MARKET. I know it is gluten free which I have to eat, but how is it on additives, etc? Anyone know? Already cooked foods are never really that healthy unless you get it from like Whole Foods or some place like that, but I have the Ronco Rotisserie machine ( who remembers this machine? Who has one? ), so if I do it then it's usually pretty healthy. Costco rotisserie chicken equals 140 calories in a 3 ounce serving. Just Google Costco rotisserie and it gives all the facts. I worked there 28 years. I have never had a problem getting nutritional facts. Tabatha OMG! I used to have one of those machines and was obsessed with it! I LOVED IT and used it like crazy! You are right, if you remove the skin on that it would be healthy and much healthier than the ones in the store. The reason is because you are controlling what you put on it. We can't control what the store puts on them. Janet, pretty much anything you eat outside of your own home (other than Whole Foods or some place like that), is going to have some type of additives. honestly,I buy an 'astronaut' chicken once a week, its all I eat when my husband is gone away for work. It's cheaper than buying a raw chicken and cooking it and way healthier than other protein options. I've never in my life seen one as bad (or tiny) as yours but I live in Canada and I suspect our standards for meat & poultry are higher than in the US. I take the chicken apart while it's still hot, that way the grease is in the bottom of the pan and I can pull off any soggy skin and toss it (the crispy skin goes into my cake hole asap!). I section everything off the carcass and usually get 6-7 meals from one bird plus if I feel like it, I will cook the bones down into broth. I think your post was a bit biased against rotisserie chickens. Considering all the other options for a quick & easy meal (lunch meat, pizza etc), a rotisserie chicken plus a salad seems like a pretty excellent choice! I bought a rotisserie chicken at Whole Foods last week because the store is a block from my daughter's house, and she wanted it immediately for a recipe she was preparing. It costs me a shocking $13.98 and was dry and tasteless!! :-( I usually buy my rotisserie chicken at Costco as it is one of the biggest bargains in town. They haven't raised the prices in years (same as the $1.50 hot dog to which I very occasionally treat myself!). I remove all the skin & fat, freeze both breasts from which I get at least two meals each, remove all the rest of the meat from the bones which I freeze in individual 3oz packets if not making soup with it, and make broth with the bones. Is it the additives that make it so moist even after freezing - probably. But I watch carefully what I eat most of the time, so I allow myself the occasional Costco hot dog (yum-m-m!) and rotisserie chicken. I cook for one most of the time and the huge Costco chicken gives me at least 8 meals for $5.99 and is consistently the best tasting rotisserie chicken I have ever tasted! By the way, the turnover is so great that they don't have time to sit on the hot table for long - if I happen to hit it just right in the morning, it comes off the spit and into my shopping cart immediately. Then home, deboned and into the freezer within the hour. Since my husband passed,there is no fun cooking for one. I go to Weiss market and.get a rotisserie chicken two or three times a week. My blood pressure has been spiking to scary levels. What are in those chickens? Would like to see input about Food Lion rotisserie fresh original FAM SZ PLN ROTIS CHN HOT.